Metawidget v1.0 is now available! Representing the culmination of two and a half years of careful incremental releases, we're proud to announce this final 1.0 release of the industry's most practical User Interface generator. The past 30 months have been an exciting ride. We've paid close attention to your feedback, conducted detailed interviews and case studies, and assisted over a dozen production deployments. We've seen Metawidget deployed at energy companies, by governments, in pharmaceutical labs, for ERP, for light and sound engineering, for telecommunications, and more. We've worked closely with key industry players and developed strong ties with the academic community - publishing conference papers and journal articles, and fostering relationships with other research teams. We'd like to thank everyone for their support in getting us this far. And now that we're 1.0, there's never been a better time to dive in and see what Metawidget can do for you! It's mature, it's Open Source, and it's ready to save you from all that error-prone, laborious, boilerplate UI code! Special thanks to Gérard Collin and Ian Darwin for their help with this release! Domain Driven Design versus Anemic Domain Model: FIGHT! I've been reading a bit lately about Domain Driven Design (DDD) versus the Anemic Domain Model (ADM). On the one hand you've got folks who argue DDD is closer to 'true' Object Oriented Programming because you keep the business logic and the data together in the same class. On the other hand most of the popular Java EE frameworks 'encourage' ADM: your POJOs are just a bunch of getters and setters, then you wrap technologies like JPA, Bean Validation, Session Beans, Drools etc around them to provide business logic. So who's right? Hmmmm? Well, I'm certainly not going to go there! All I wanted to blog was that Metawidget doesn't mind, and works great with both approaches. This is because Metawidgets are lightweight: there's no problem combining several of them in the one screen, each pointing to a different part of your domain model. Here's another neat trick I've discovered while using Metawidget in my own work. Metawidget comes with multiple Inspectors to inspect different aspects of your back-end architecture. It then merges the result. This merging is done by CompositeInspector which is itself just another Inspector and therefore pluggable. This means you can plug in different ways of running and merging multiple Inspectors. What sorts of different ways? Well, since each Inspector is immutable, it's easy to isolate each one in its own Thread. And if you have some fancy processor with a bunch of cores (12, anyone?) you may as well put them to use! * Overriden to use a CyclicBarrier to run inspectors concurrently. This should spread the load across your cores. It's not a no-brainer: some Inspectors may rely on ThreadLocal variables (like FacesContext) and so will need to be kept on the primary Thread. But where it can be used, it works well. I thought I'd post a few blog entries about 'neat tricks' I've discovered while using Metawidget for my own clients (eating my own dog food, as it were). It's a cool component, but for me it lacks an important feature: once you've chosen a color there's no way to unchoose it - to clear the box. 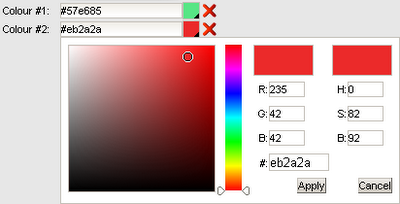 This is annoying because typically getColor is a nullable field, so we need a way to null it. One approach would be to extend HtmlColorPicker (or its Renderer) and try to add the extra functionality - but that can be a bit scary.